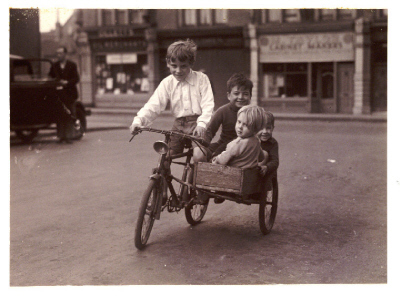 i b i k e l o n d o n: Friday Throwback: would you let your kids ride this bike? Friday Throwback: would you let your kids ride this bike? It's nearly the weekend, which means it is time for another in our occasional series of Friday Throwbacks, looking at the best images of bicycles and cyclists from days gone by which have been uploaded to the Flickr Commons. I'm all up for children's freedom, and despair at what indoor and restrained lives kids today lead, but even I am not sure if I'd let me kids ride this bike around town... Still, it looks like they're having a great time, doesn't it? This photo is via the National Media Museum, who host a wealth of historic photographs online. Whatever your cycling plans this weekend, whether two-wheeled or three, be sure never to miss another post from ibikelondon again! You can join the conversation on Twitter or follow our Facebook page. Happy cycling!